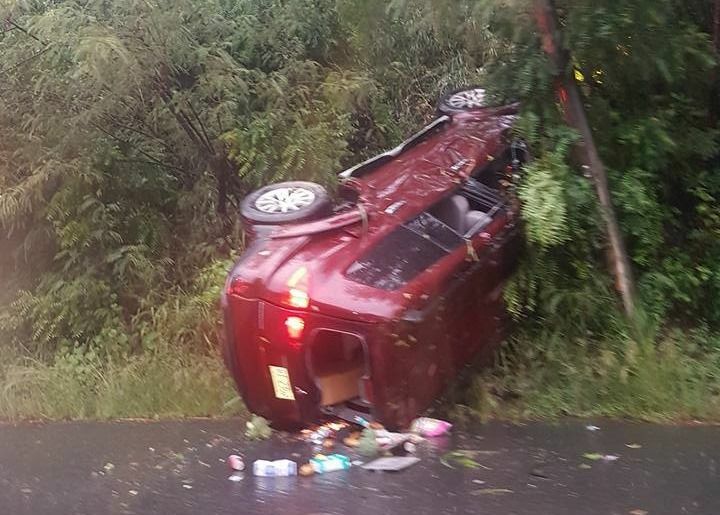 HAVERS, Tortola, VI- At least four persons reportedly escaped serious injuries when the vehicle they were in somehow ended up on its side at Havers, on the main island of Tortola, today, November 22, 2016. According to reports, the lone vehicle accident occurred sometime before 5:00 P.M. The territory endured inclement weather throughout the day, however, it is not clear whether that was a factor in the accident. Persons on the scene indicated to this news site that the occupants of the vehicle suffered minor bruises. 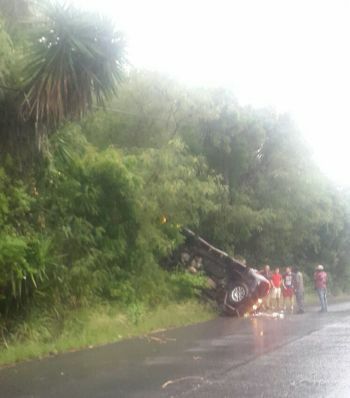 Earlier today, a safari vehicle transporting tourists to Cane Garden Bay encountered difficulties on Joe’s Hill and ended up hitting the side of the road. No one was reportedly injured. With such bad weather, I have seen irresponsible people driving fast and no regard foe other drivers. I hope these people are okay. it didn't get up there it got down there from the road above which is very slippery when wet. Didn't the same thing happened not to long ago to another driver in the same spot? Darn.. wish I was out to post this on facebook! It is ridiculous and short sighted to have an asphalt surface on steep grades. Firstly, asphalt contains petroleum, producing slippery conditions even on flat roadways when it rains. Why our government would see fit to use asphalt EVERYWHERE is beyond me. They should be made of graded concrete ONLY. Full stop. Where are the sturdily built and well positioned guard rails that would help prevent such accidents and possible loss of life? All steep grades and hairpin turns should be crowned and banked for drainage, with proper gutter systems in place to carry the run off safely away from the road and any other place where water can cause damage to property or undermine other roadways below. Our roads are constructed as cheaply as possible. Road longevity and safety are not even considered. It's all about the green back dollar folks. Let's face it, even though most of us would prefer to think otherwise, ours is a third world country where life is cheap and politicians do things only when they HAVE to. They don't want to spend "THEIR" budget on uninteresting things like good solid infrastructure. They want to spend "THEIR" money on things they can puff up their chests and crow about. My advice, stay home when it rains and definitely don't go down Joe's Hill Road, the Elevator or any other steep road. Wait for the weather to pass and for the roads to dry. They weren't designed to be used in rainy weather, and that's a fact.